According to Fat Cat, this fish actually ate that worm!!?? This one was actually caught too, by Insta user dustinwheelerfishing. Prop wound?? K-Pink takes on pirates and spectators. > Unlike Ike, I contend that spectators ARE becoming an issue at some Elite events. I’m still shocked that there hasn’t been a boating accident involving spectator boats, and I feel it’s only a matter of time before one occurs. 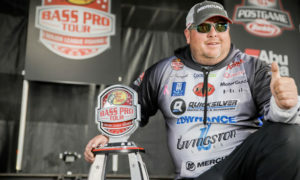 > I contend that as long as bassin’ allows the public at large on the field of play to potentially affect the outcome of events, it’s nothing more than a bubba-in-a-boat-fruitjar-derby. 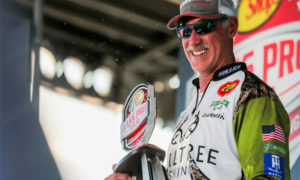 > MLF has it correct with the limited number of competitors on the water every day over multiple days and the catch-weigh-release system. B.A.S.S. 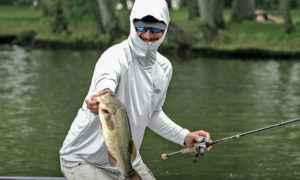 is on the right track with Live coverage of anglers. 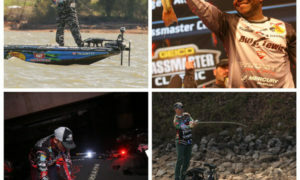 True Pro Bass Fishin’ involves all three of these aspects. If’n y’all wanna get in the Melons of the Week section, need you to email, FB or IG your shot of a DD plus where you caught it and the deets: bait, color, how fishing it. No guarantees it’ll get in but that’ll help! Always wondered why Japanese bassin’ stuff is all so good, so exacting, etc. 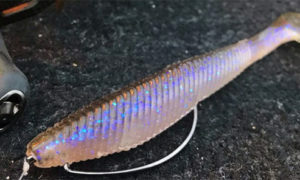 Got a chance to try to figure it out firsthand recently, by interviewing Nishi, Yo-Zuri’s bait designer. What I found is on BassBlaster.rocks, but the bottom line is obsession with every single detail, and that seeming to be WAY more important than any time pressure to get a bait out on the market.He talked about designing these two rad-looking baits, the the 3DB Pencil and 3DB Prop. 100 prototypes!!! 1. Texoma Bassin’ Festivus stuff. Fletch Shryock noodling. No rules against this Trip? Shimano Garage is at the event. Bring your reel (1 per person) in for a tuneup plus there’s a ‘Shimano’s Best Bassin’ Dad Search’ contest there on Sunday, June 12. [Is everybody sayin’ “bassin'” now?? Too funny.] If you win, gitcha VIP treatment and Mercer yellin’ at ya! 2. FLWer Mark Rose won Southern Opens.#Stout brother! 3. FLWer Michael Murphy webinar June 15. Ch-ch-chain, chain of fooooood. The Murph knows his stuff, should be good. 4. FLWer Scotty Suggs gets Popticals. Sunglasses you put in your toaster! Or freezer?? Okay not really. Nylon lenses made by Zeiss = could be cool? 5. 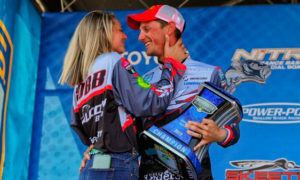 Wild West Bass Trail #s.
> Anyone notice that Richard Dobyns won $25.5k and Nick Nourot won $7,500 for 2nd, last-place pro check was $1,500 all this for a $700 entry fee. 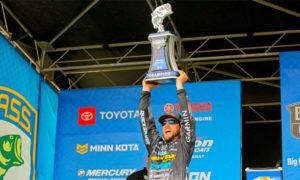 Co-angler champ Josh Kaneko won $5,500, last co-angler check was $700, all for $350 entry fee. 6. MO: Big Smithville bag. Tom Alsop and Keith Leftridge with 5 for 25.36 lbs, all caught in flooded veggies. They were culling 4s, which I hear is rare for there. More deets:Big Bite Trick Sticks [Senkos] in junebug, 3/0 Gamakatsu EWGs, 22-lb Sunline Flippin’ Fluoro, 7′ Denali Lithium (heavy) rods. 7. KY/TN: Yak champ is Ron Champion. > When you’re cheating at a kayak-based bass fishing competition, it might be time to take a good, hard look at your life. When you’re cheating at anything would be. Sheesh. Probly all motivated by this kayak cheater getting caught. 9. LA: Guy caught with too many largies. > Possessing over the limit of black bass brings a $100 to $350 fine and up to 60 days in jail. 10. AL: Auls win 3rd straight ABA military derby. 11. CA: 32.23 to win Delta Wednesday-nighter. Included a 10.96. Caught ’em all on top: two biggest on a River2Sea Spittin’ Wa [frog] and the rest on a Whopper Plopper.12. ‘Bubonic’ SPRO BBZ-1 Rat. Shoulda called it “Chernobyl.” Check the normal BBZ-1 Rat colors here.13. New bigger Megabass jerkbait. 15. New electronics training DVDs. 16. AR: 100sK largie fingerlings released from jail. Raised by folks in the penitentiary. 17. 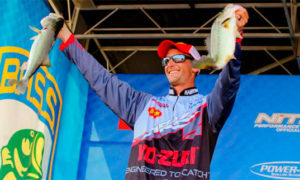 AL: Black Belt bass photo contest. Black Belt = 23 counties. 18. AZ: Powell PFD swap on Saturday. …of an LED nature. It’s kinda dense language, but the way I read it is: A bunch of these LED lights for boats don’t meet USCG specs, and if they interfere with the nav lights they are no good. It diminishes the primal instinct we have to follow fish movement and behavior through our natural senses. > Least favorite fishing technique: Ledge-fishing with electronics. To me, this takes the fun and intuition out of fishing. It diminishes the primal instinct we have to follow fish movement and behavior through our natural senses. So: Are electronics making us dumber…like Google is?? That’s a Jackall Jaco finesse crank. Fish can recognize human faces. So…catch and release is a bad idea? Can Trip catch a fish anymore?? Is this why Mercer only shoots his show in Canada?? Is this why everyone’s wearing Buffs?? So many questions now…. I hate to admit this but….the last two made me want to throw up. I might have just cut the lines and let them go! I know, Big Girl!